How many times have you read a news headline about another young person in a driving accident? Sadly the majority of times it turns out to be a boy, and now that my boys are starting to grow up I am thinking about the future and of ways to keep them safe. 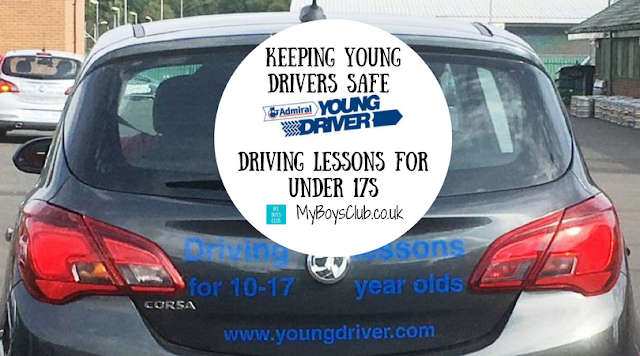 Driving lessons for under 17s is one way to start the process. 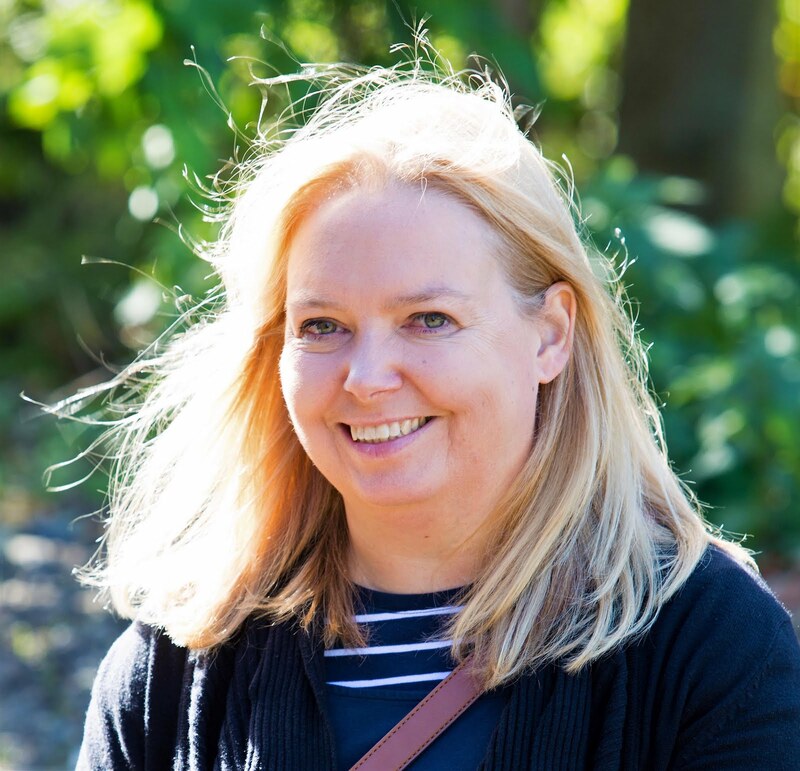 Driving is such a useful skill to have and I’d like my boys to be able to drive one day – in the hope that they can chauffeur me around (I can dream). Driving is not only useful but fun, exhilarating, opens up new adventures but it doesn’t come without its risks but I’d also like them to understand the importance of driving safely too. We were offered a complimentary driving lesson from Young Driver for both of our boys recently. I didn’t even know that they existed. At first, I thought they were too young. They are 8 and 10. However, after thinking about it I decided it’s never too early to think about road safety. Not only would it start to develop their awareness as future road users but I thought it would also be beneficial to them as pedestrians and cyclists too. Research from Young Driver shows that early driving experience cuts road accidents by 40%. With 1 in 5 young people crashing within 6 months of passing their tests, anything that reduces accidents among this group must be a good thing. There are 60 Young Driver centres around the country offering driving lessons to under 17s. We chose the one Newcastle Racecourse which offered both the sessions for 10-17 year old but also for 5-10 year olds too. There are different dates and times for each site as the teams of instructors move around the country. At each site, you will find beginners' zones and a full road system with traffic signs, junctions, and parking zones to encourage responsible driving, not high-speed thrills and spills. First to drive was my youngest. At only 8 years of age, he would be driving an electric car called a Firefly. 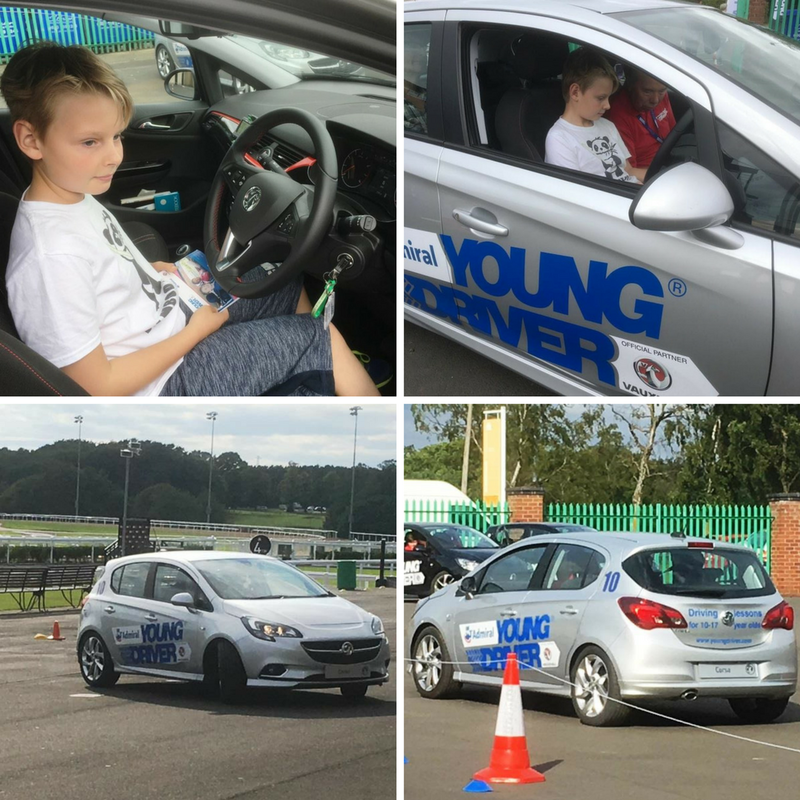 YOUNG DRIVER™ has created a range of special cars for 5 – 10 year olds to drive at various locations around the UK. Called “Firefly”, the two-seater feature independent suspension, disc brakes, twin electric motors, rack and pinion steering, indicators and head lights – making them drive and handle just like real cars on the road. When I first showed him the image of the car I have to say that he didn’t look that impressed because he knew his brother would be driving a proper car. However, that didn't last long while once he was behind the wheel and he loved every single minute of it. An instructor took him through a quick briefing, explaining how to safely drive the car taking him through how to operate it, using the pedals and steering wheel correctly but also the road signs that had been put out on the course, realistic mini driving zones, such as one way and give way, and having an awareness of other road users. The 20-minute session would have cost £19.95. No, it’s not a proper car, but he loved it. Top speed is only 10 miles per hour but it’s a great way to start understanding about cars. He has learned lots about road safety and why it’s important and he’d love to go again. He also got his first driving license that he is very proud of. I don’t think my 10 year old could quite believe that he was going to be allowed to drive a proper car. As long as you are 10 years old and over 1m 42 cm in height then you can drive a car. His was a 1.4 Corsa. Yes, it has dual controls, but it’s still a proper car. In your first lesson you learn how to start, drive, brake, corner, change gear, stop and even reverse following the Driving Standards Agency curriculum, and young people are not be taught anything that is not centred on driving safely and properly. The 30-minute session started with a safety briefing and then they were off. 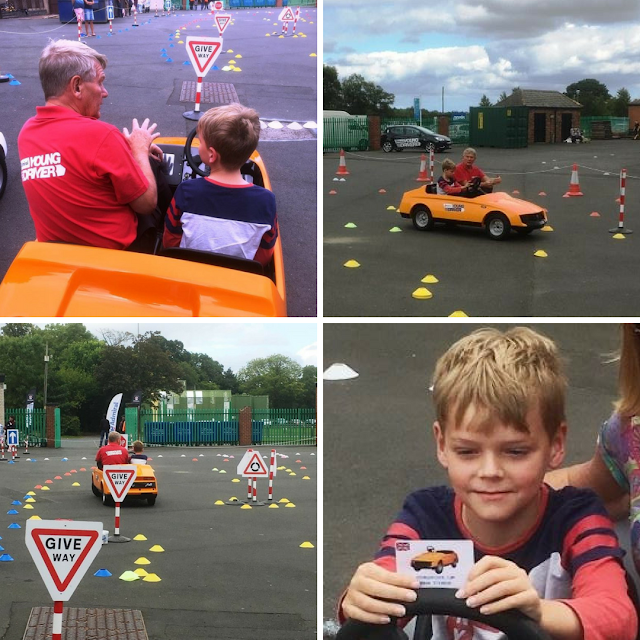 A course had been set up around the paddock area of the racecourse with cones to slalom through both forwards and in reverse; steering round corners, turning around and also parallel parking – he was very pleased that his effort reached the standard required in an actual driving test. The instructor was very professional yet friendly, informative and approachable, had lots of patience, explained everything clearly and gave my son lots of confidence. Again he absolutely loved his driving experience. He’d love to complete a whole course. If he did go again he has a Drive Diary detailing what he has already achieved so the learning can be developed. The personalised Drive Diary charts individual progress and current level of driving and is completed by the instructor after each driving session. At 8 and 10, my boys are ‘tweens’ now. Considered too old to be a child and too young to be a teenager, but I think this is one of the first activities they have done when I have really realised they are growing up. As a parent, it's our role to ensure we prepare them for their futures and introducing them to road safety and how to drive responsibly at a young age is definitely one way to do this. These lessons would also make amazing birthday or Christmas presents for any boy or girl too. DISCLOSURE: We received 1 30-minute lesson and 1 20-minute lesson free of charge for an honest review. Young Driver is also supplied the competition prize of a free lesson. Research, from Young Driver, shows that early driving experience cuts road accidents by 40%. With 1 in 5 young people crashing within 6 months of passing their tests, anything that reduces accidents among this group must be a good thing. There are 60 centres around the country offering driving lessons to under 17s. We chose Newcastle Racecourse which offered both the sessions for 10-17 year old but also the new ones for 5-10 year olds too. At each site, there are beginners' zones and a full road system with traffic signs, junctions, and parking zones to encourage responsible driving, not high-speed thrills and spills. When I first showed him the image of the car I have to say that he didn’t look that impressed because he knew his brother would be driving a proper car. However, he loved every single minute of it. An instructor took him through a quick briefing, explaining how to safely drive the car taking him through how to operate it, using the pedals and steering wheel correctly but also the road signs that had been put out on the course, realistic mini driving zones, such as one way and give way, and having an awareness of other road users. The 20-minute session would have cost £19.95 No it’s not a proper car, but he loved it. Top speed is only 10 miles per hour but it’s a great way to start understanding about cars. He has learned lots about road safety and why it’s important and he’d love to go again. He also got his first driving license that he is very proud of. I don’t think my 10 year old could quite believe that he was going to be allowed to drive a proper car. As long as you are 10 years old and over 1m 42 cm in height then you can drive a car. His was a 1.4 Corsa. Yes it has dual controls, but it’s still a proper car. In your first lesson you learn how to start, drive, brake, corner, change gear, stop and even reverse following the Driving Standards Agency curriculum, and young people are not be taught anything that is not centred on driving safely and properly. The instructor was very friendly, informative, and approachable, had lots of patience, explained everything clearly and gave my son lots of confidence. Again he absolutely loved it. He’d love to complete a whole course. If he did go again he has a Drive Diary detailing what he has already achieved so the learning can be developed. The personalised Drive Diary charts individual progress and current level of driving and is completed by the instructor after each driving session. At 8 and 10, my boys are ‘tweens’ now. Considered too old to be a child and too young to be a teenager, but I think this is one of the first activities they have done when I have really realised they are growing up. As a parent, it is our role to ensure we prepare them for their futures and introducing them to road safety and how to drive responsibly at a young age is definitely one way to do this. What do you think of driving lessons for under 17s? Are girls excluded ?? My 11 year old grand-daughter can already drive a Mitsubishi double cab truck and tow a horse trailer (all perfectly legal on private land of course) but some form of training for normal driving on roads in the future would be very welcome. My sons just tured 11 he would realy enjoy this experince. This is such a wonderful idea! I'd love to give this as a gift.